401(k) Loans - What Can Go Wrong? 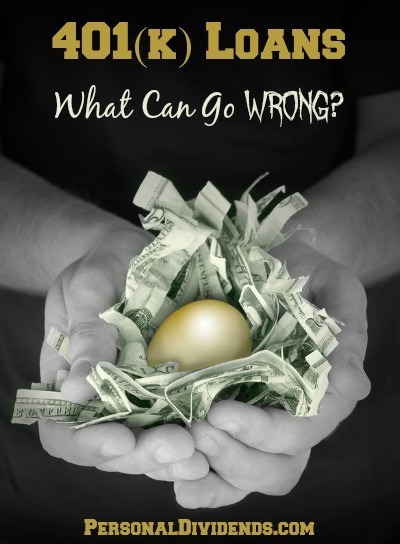 401(k) Loans – What Can Go Wrong? 401(k) loans have become a fairly common means of obtaining financing for non-retirement related purposes. This is especially true since the financial meltdown and the tightening of lending guidelines for other types of loans. A 401(k) loan is easy to get – in fact, it’s generally automatic – since it is secured by the 401(k) plan, and since you are employed by it’s sponsor. But as easy as 401(k) loans are to obtain, doing so isn’t always the best course. There can be unforeseen consequences, and some of them can actually cost you serious money. One of the biggest problems with 401(k) loans is that they are employer specific. Even though your 401(k) plan is portable – you can roll it into an IRA, or even into the 401(k) plan of your next employer – any loans that are attached to the plan are not. Whether you quit voluntarily or are let go by your employer, any loans attached to your 401(k) plan will become due shortly after employment separation. It’s not simply a matter of continuing to make payments on the loan after you leave your job. Your employer will require that you pay back the entire balance within a couple of months of leaving the company. Technically speaking, your employer is not required to make you payoff your 401(k) loan. You’re problem will be the Internal Revenue Service (IRS). Under IRS regulations, any 401(k) loans that are not repaid shortly after termination are required to be classified as plan distributions. The IRS takes the position than an unpaid loan from a 401(k) plan is actually a distribution, and a taxable event. You will be required to pay income taxes on the amount of the distribution (the principal amount of the unpaid 401(k) loan balance). The distribution will be added to your other income on your tax returns, and will be subject to regular income tax on both your federal and state income tax returns (if your state has an income tax). But if that prospect isn’t scary enough, the IRS will also assess a 10% penalty on the amount of the unpaid loan balance, as an early withdrawal penalty. If you are in the 28% tax bracket for federal income tax purposes – and a large loan distribution could conceivably put you in that bracket – plus a 7% state income tax rate, plus the 10% early distribution penalty, you could be looking at a total tax bite of 45% of the amount of the unpaid loan balance. You should seriously contemplate the potential for this outcome if you’re thinking about taking a 401(k) loan. Not all of the problems associated with a 401(k) loan are financial. You have to consider the wisdom of using a retirement asset – like a 401(k) plan – for non-retirement purposes. When people borrow against 401(k) plans, it’s typically for purposes such as home improvement, debt consolidation, buying a new car, or even paying for college education. As important as any of these purposes might be, if you’re tapping your retirement plan to pay for them, you are also diluting the whole purpose of having a retirement plan first place. A retirement plan is supposed to be for retirement. By borrowing against the plan for non-related purposes, you are also adding unnecessary risk to your retirement plan (see tax consequences above). Human habit is another factor that should be considered. Borrowing leads to more borrowing – if you have “successfully” borrowed against your 401(k) plan in the past, you’re very likely to do it again in the future. In fact some people become serial 401(k) borrowers, taking one loan after another. At the time it seems like the right thing to do, after all – borrowing against the 401(k) plan is easy to do. This is especially true if you have credit or debt problems, and can’t get credit elsewhere. But you could put yourself in a position of accumulating a large 401(k) plan for your retirement, but sacrifice a substantial portion of it for loans to pay for unrelated purposes. Just as it is possible to get into trouble with other types of loans, the same can happen with 401(k) loans. If you’re contemplating taking a 401(k) loan, consider the potential problems above, and think long and hard if it’s the right thing to do.